Effective September 1, 2015, Texas has adopted the Texas Real Property Transfer on Death Act ("TODA") (codified as Chapter 114 of the Texas Estates Code), which authorizes people to convey real property in Texas by means of a Transfer-on-Death Deed ("TODD"). TODDs may be made or revoked by the transferor at any time prior to his or her death, but may not be created by a power of attorney. To be effective, the revocation must be signed after the TODD being revoked and filed in the county records before the transferor's death. For a TODD to be effective, its beneficiary is not required to be notified of the TODD, to be delivered the TODD, or to accept the TODD, during the transferor's lifetime. However, a designated beneficiary may disclaim all or part of such beneficiary's interest in the property once the designated beneficiary learns of the TODD. The beneficiary must survive the death of the transferor by 120 hours. If the beneficiary accepts the property, the beneficiary takes the property subject to any existing liens, encumbrances, mortgages or other third party interests. TODDs are effective only if signed on or after September 1, 2015, by a transferor who dies on or after September 1, 2015. The complete text of the Texas Real Property Transfer on Death Act, including an optional form of TODD and an optional form of revocation of a TODD (each of which is included in Subchapter D of the TODA), is available here. Last month I had the pleasure of attending an event at TCU at which Russell Gold was the keynote speaker. The event was part of the "Leaders in Energy" speaker series sponsored by the TCU Energy Institute. Russell Gold is the Senior Energy Editor at the Wall Street Journal and the best-selling author of "The Boom: How Fracking Ignited the American Energy Revolution and Changed the World." I read "The Boom" recently and cannot recommend it highly enough for anyone interested in the energy industry, technology, the environment, the North Texas history and economy, or the world economy. The book explores history, technology, and personalities that have developed and exploited hydraulic fracturing (a/k/a "fracking") to change the oil and gas industry, which is in turn changing the world. Although it no doubt increases my interest in the book that some of our own clients and my own friends are mentioned and quoted in its pages, I suspect that most readers would find the material in the book interesting and well organized and presented. It is hard to believe how much the world has changed since the first successful modern frack of a natural gas well in shale rock was conducted by Mitchell Energy on the S.H. Griffin #4 well in Ponder, Texas on June 11, 1998. Given that generally everybody in the oil and gas business credits George P. Mitchell of Mitchell Energy with being the father of modern fracking, this blogger cannot help but wonder why more public buildings, roads or other public structures have not been named after him, especially here in Tarrant County, the heart of Barnett Shale country. One of the cool things about practicing law at a firm that is 130+ years old is that it seems I'm always hearing new bits of our firm's history. A recent example is an article in the August 24-30 issue of Fort Worth Business about H.H. Holmes, America's first serial killer. Mr. Holmes and his murder spree at the 1893 World's Fair in Chicago was the subject of the best selling book by Erik Larson titled "Devil in the White City." According to the article, the co-founder of Cantey Hanger LLP (originally Capps & Cantey), Willam Capps, represented three of Mr. Holmes's victims, and Mr. Capps's investigation of their mysterious deaths was a factor in Mr. Holmes choosing to depart from Fort Worth before completing construction of the "murder manor" Mr. Holmes was building in downtown Fort Worth near the present-day Mercury Chop House. Mr. Holmes used a similar "Murder Castle" that he built in Chicago as the venue to torture and kill many of his victims. Hence, our firms intrepid founder's investigation may well have saved the lives of many Cowtown residents by hastening Mr. Holmes's exit from town before the murder manor could be completed and placed into operation. Well done, Mr. Capps, well done. Congratulations to the Texas legislature for authorizing the Endless Shareholder Agreement. Virtually every closely held private corporation should have a shareholder agreement to address, if nothing else, restrictions on transfer of the shares. Otherwise, you may find that one of your fellow shareholders has transferred his shares of the company's stock to the company's biggest competitor, or worse yet, your ex-wife! Shareholder agreements are especially important for a corporation taxed as an S-corporation, because a transfer of shares to a person who is not eligible to be a shareholder of an S-corp can terminate the company's S-corp status and result in adverse tax consequences for the company's shareholders. Shareholder agreements can also address other issues, such as establishing a procedure for shareholders to buy or sell each other's shares (i.e., a buy-sell agreement), modifying shareholders' statutory voting rights or strengthening shareholders' information rights. But for shareholder agreements adopted prior to September 1, 2015, there has been a trap for the unwary. 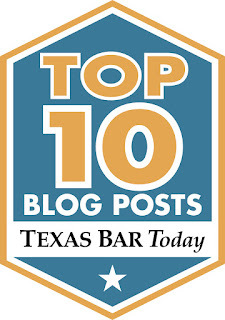 Under Section 21.102 of the Texas Business Organizations Code (TBOC), shareholder agreements were only effective for ten years unless the agreement provided otherwise. Thanks to recently adopted S.B. No. 860, which amends Section 21.102 of the TBOC, however, the default assumption for shareholder agreements will flip on September 1, 2015. Shareholder agreements adopted after that date will be effective forever unless the shareholder agreement provides otherwise. Shareholder agreements adopted before that date will continue to be subject to the 10-year limit under the prior law, unless the agreement provides otherwise. The new law is probably more consistent with shareholders expectations and is therefore a step forward for Texas business law. George Costanza: That's why I'm different. I can sense the slightest human suffering. Jerry Seinfeld: Are you sensing anything right now? This is my second blog post in my occasional series on "M&A and the Wisdom of Seinfeld." You can read my first blog on knowledge qualifiers here. I'm a big believer in the notion that practically every aspect of our lives has been commented upon in a Seinfeld episode! The exchange between George and Jerry above is a great example of the importance and utility of materiality qualifiers in an M&A transaction. Materiality qualifiers help ensure that parties to an M&A transaction aren't unduly damaged by the slightest suffering. Let me explain. Let say BigCo wants to acquire TargetCo and the parties enter into an asset purchase agreement (APA) with a purchase price of $50 million. The APA includes numerous representations and warranties by TargetCo, including a representation that TargetCo's financial statements are true and correct in all respects. Suppose also that one of BigCo's conditions to closing the APA is that all representations and warranties of TargetCo are true and correct in all respects. Finally, let's suppose the indemnification provisions of the APA permit BigCo to sue TargetCo for the breach of any representation or warranty, whether or not BigCo knew about the breach prior to the closing. Now assume that after the APA is signed but before the transaction closes BigCo determines that the amount of cash on TargetCo's balance sheet was misstated by $2.37. Under a strict reading of the APA, BigCo can now weasel out of the deal and refuse to close! One of TargetCo's representations and warranties was false, so one of the conditions to BigCo closing the deal cannot be satisfied, and BigCo can walk. Suppose instead that TargetCo had represented and warranted only that its financial statements were true and correct "in all material respects." Or suppose the closing condition only required representations or warranties to be true and correct in all material respects. In either case, arguably the $2.37 misstatement would be deemed immaterial in the context of a $50 million transaction, and if BigCo wanted to walk the deal, it would be forced to try to find another reason to do so. Likewise, if TargetCo had added a materiality qualifier to the representation and warranty regarding the accuracy of its financial statements, or if the indemnification provisions of the APA included a materiality qualifier, TargetCo could avoid being sued for a breach of the APA as a result of the financial statement error (again, assuming the $2.37 misstatement was indeed immaterial with respect to the transaction). This week I had the pleasure of attending the Unmanned & Autonomous Systems (UAS) Consortium, which is sponsored by the North Texas Association of Manufacturers (NTAM) and the Arlington Chamber of Commerce's Center for Innovation (CFI). Unmanned & Autonomous Systems (a/k/a drones) are getting more important and more common every day for military operations, hobbyists, news and entertainment, agriculture, and many other areas. According to their website, which is available here, the UAS Consortium was formed "for the research, development, implementation and commercialization of new technologies to improve all aspects of the unmanned aircraft system industry, and the related education and training needed to ensure a competitive workforce." North Texas is the perfect place to hold such a consortium because of the many aviation industry participants and defense contractors that call this area home. This week's consortium featured presentations by representatives of NTAM, who manages the UAS Consortium, Romeo Engineering, who designs and builds some amazing machinery for the defense industry and private industry, and Texas Tech University, where some important research on drones is being conducted. The North Texas area is lucky to have so many leaders in the emerging UAS industry. If you'd like to learn more about the use of drones in Texas, my partner, Scott Fredricks, recently published an article on the use of drones in Texas which is available here. Now you can follow the Fort Worth Regional Office of the U.S. Securities and Exchange Commission on Twitter at @FortWorth_SEC. As of the date of this blog post, since the Fort Worth Regional Office signed on to Twitter on September 22, 2014, it has "tweeted" 314 times, has amassed 1,128 followers. reports of enforcement actions or other activities of the office. Wednesday I had the pleasure of attending the 2015 TECH Fort Worth IMPACT Awards. As always, the event had a lot of energy and showcased some of TECH Fort Worth's most successful past and current clients. This year's keynote speaker was Alvaro Guillem, Ph.D., the President and co-founder of ZS Pharma Inc. ZS Pharma became a client of TECH Fort Worth in 2009, and as of the posting of this blog post, it has a market capitalization of $1.2 billion. Dr. Guillem walked the audience through the benefits of its drugs for those suffering from hyperkalemia (elevated potassium levels) and ZS Pharma's early stage financing efforts. I was especially interested to learn that ZS Pharma benefited from an investment from the Texas Emerging Technology Fund, a $485 million fund created by the State of Texas to, among other things "help start-up companies get off the ground faster and attract high-tech jobs" (according to the website of the Office of the Texas Governor). Beartek Gloves, who makes "smart" gloves that allow wearers to control electronic devices without removing the gloves. They are marketing especially to motorcyclists, skiers, and snowboarders, to make their activities safer and more convenient. Ben Hogan Golf, who is re-launching the Ben Hogan brand of high quality, precision golf clubs. Ampcare, who sells devices and techniques involving therapeutic neuromuscular stimulation technologies for the treatment of dysphagia (swallowing disorders). Ampcare was the "people's choice" award winner based upon a real-time vote by audience members at the event. It is truly inspiring to see all of the great ideas, great people, and great companies that are attracted to and benefit from TECH Fort Worth, "a business incubator focused on helping entrepreneurs bring innovative technologies to market." The Fort Worth business community is certainly lucky to have the TECH Fort Worth team in our corner. Time for Chancery Courts to come to Texas? There is a currently bill in the Texas House of Representatives which would create the first Chancery Courts in Texas. What are chancery courts and why would Texas benefit from them? Chancery courts specialize in complex business disputes, especially those involving mergers and acquisitions and corporate and securities matters. The theory is that a court that specializes in complex business disputes is likely to understand the issues better, provide swifter justice, and provide more consistent and therefor more predicable business law decisions. Of course, the most famous chancery courts are those in the State of Delaware. Part of the reason Delaware is such a popular state in which to incorporate a business is that companies know they can gain access to the Delaware chancery courts, which are regarded is especially good at delivering (relatively) swift, certain, and fair decisions. That may not always be the case in other states where "regular" courts cannot focus on complex business issues because they must also hear cases involving family law, torts, probate, and a myriad of other non-business matters. As you might have guessed, I think having chancery courts in Texas is a terrific idea. It helps underscore the message that Texas is business-friendly and a great place to start a business and to obtain justice for your business, if necessary. an action arising out of the Business Organizations Code. Rule 506(b)'s Merit - and Is there Merit to Merit Review? An overwhelming majority of private placements of securities in America are done by means of sales strictly to accredited investors in reliance upon the exemption from the registration requirements under the Securities Act of 1933 afforded by Rule 506 under Regulation D (now known as Rule 506(b)). No Uncertainty. Rule 506(b) provides a tremendous amount of clarity for issuers of securities seeking to ensure that they have a valid private placement exemption. So long as an issuer has a reasonable belief that all of its investors are accredited and the issuer refrains from engaging in public solicitation activities, the issuer will generally have a valid private placement. Outside of the "safe harbor" of Rule 506(b), other factors (some of which are identified below) can complicate the analysis and/or limit an issuer's freedom when offering securities. For example, if an issuer wishes to rely upon the exemption afforded by Section 4(2) of the Securities Act, it better get ready to sort through decades of case law and SEC releases on what exactly it means to have a "transaction by an issuer not involving any public offering." No Dollars Limits. This benefit speaks for itself. Rule 506(b) puts no limits on the dollar size of a private placement. Contrast that with Rule 504 which limits issuers to raising $1 million or Rule 505 which limits issuers to raising $5 million. No Investor Limits. Rule 506(b) permits sales to an unlimited number of accredited investors. Contrast that with the Section 4(2) exemption which provides no statutory guidance regarding how many investors may invest before a private placement turns into a public offering. No Blue Sky Compliance. Securities sold in reliance on Rule 506(b) are deemed to be "covered securities," thereby preempting most state level blue sky regulation. States may require issuers to make a notice filing, pay a small filing fee, and consent to service of process in any state where it sells securities, but issuers who sell "covered securities" need not register or find a valid exemption from registration in up to 50 different states. No Disclosure Requirement. While Rule 506(b) permits sales to up to 35 unaccredited investors, issuers rarely permit unaccredited investors to participate in Rule 506(b) private placements because doing so requires issuers to provide a detailed private placement memorandum to every investor, which is generally cost prohibitive. By limiting sales exclusively to accredited investors, there is no information disclosure obligation upon the issuer (though it is generally advisable to provide at least some disclosure document to each investor to insulate the issuer from potential securities fraud claims). No Verification Requirement. The SEC recently adopted Rule 506(c) which permits issuers to engage in public solicitation in connection with private placements so long as the issuer "verifies" that all investors are accredited. But since the steps that an issuer must take to "verify" an investor's status are somewhat vague (and/or are somewhat intrusive on the investor) at this point, most issuers engaging in private placements continue to rely upon Rule 506(b) and its lower standard that the issuer have a "reasonable belief" that its investors are accredited. Today I want to focus on Item 4 above - the preemption of potential multi-state blue sky registration and/or review by state level securities regulators (such as the Texas State Securities Board). How valuable is it to avoid such review and regulation? Very. Even if every individual state securities regulatory body was a marvel of efficiency and reasonableness, merely getting familiar with the registration requirements and/or exemptions from registration in up to 50 states would be a challenging task for issuers. But consider states that require so-called "merit review" of a securities offering. That's when a state-level blue sky regulator takes it upon themselves to look beyond whether or not the issuer has fully disclosed the material information about the issuer and the offering to determine if a particular investment is "fair" to potential investors. I have serious doubts that the twin goals of investor protection and facilitating capital formation for the US economy are advanced by merit review by state blue sky securities regulators. For example, according to an article by Samual S. Guzik in a recent issue of the Texas Journal of Business Law, in 1980 securities regulators in the Commonwealth of Massachusetts and other states prohibited "ordinary investors" from participating in an IPO for Apple Computer, reasoning that the offering price was too high relative to the company's book value!